Title Text wrote: Merry Christmas from xkcd! Gonna be a little thick here, is this suggesting a relative light saturation for vague blobs of the comic? Is that what's going on? Merry Christmas by the way! This was clever as hell. It took me a few minutes to figure out the large spectrum was from a fire, but I laughed when I got it. It's the spectral content of each light source appearing in the comic. A neat little skit. Wonderful! Well, that's a wrap, time for bed. Thanks for the confirmation of some thoughts. I'm glowing inside, filled with Christmas spectrum. I love this! Took me a second to connect "fireplace." The star's spectrum is kind of interesting, too. Each spectrum can make a sound, like a bell. Life is, just, an exchange of electrons; It is up to us to give it meaning. We are all in The Gutter. Some of us see The Gutter. Some of us see The Stars. Those that want to Know; Know. Those that do not Know; Don't tell them. They do terrible things to people that Tell Them. What's the peak in the infrared in the fire? Is it a wood or gas fire? CatCube wrote: This was clever as hell. It took me a few minutes to figure out the large spectrum was from a fire, but I laughed when I got it. 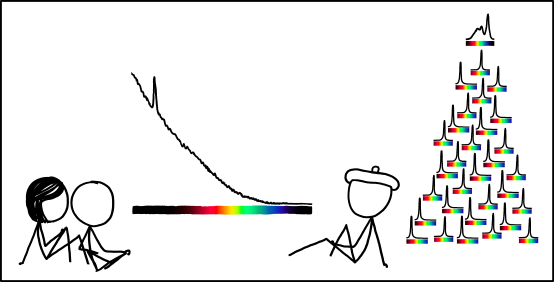 Anyone up to the task of deriving the color of each light from the spectrum? Tree lights are red and green. Star on top is probably white. Fire is reddish. The "white" LEDs in that star would never convince a mantis shrimp. Living in the Southern Hemisphere, it took a little while to get the idea of 'fire' for the big spectrum. The idea of fireplace at Christmas just doesn't 'click' to me. tarry wrote: Tree lights are red and green. Star on top is probably white. Fire is reddish. Shishichi wrote: Applies a sexward force to counter the sexpression effect that Forward Advection can apply to fluid density, particularly along sextainer boundaries. In this way, the sextribute attempts to conserve the overall fluid volume ensuring no density loss. It's a cool white; the blue spike is more intense than the red-green bump (top spectrum from your link). tarry wrote: What's the peak in the infrared in the fire? Is it a wood or gas fire? Without looking it up (because I have no idea where to look it up) I'd guess that it's an emission line from either carbon dioxide or carbon monoxide. Whenever visually representing the universe, it's important to include a picture of Saturn! CatCube wrote: It took me a few minutes to figure out the large spectrum was from a fire, but I laughed when I got it. At first I thought it was the heart-warmth. but the spectrum inside is delightfull. dtilque wrote: Without looking it up (because I have no idea where to look it up) I'd guess that it's an emission line from either carbon dioxide or carbon monoxide. I recall from high school chemistry sticking a glass tube into a candle flame and burning the hydrogen on the other end. I think wood works the same. I think you need a heated gas to produce the spectral line and I think that gas is wood gas. Wnderer wrote: I think it's hydrogen. The hydrogen emission lines in your picture are in the ultraviolet, with wavelengths between 900 and 1300 Angstroms. Visible light is between 4000ish Angstroms (purple) and 7000ish (red). You've already answered your own question. It IS infrared. Not any more complicated than that. That's because it's not really a fireplace we're seeing, but the red-shifted tailights of Santa's receding sleigh. You're right. I looked at that graph and mistakenly read nanometers. EDIT: On the Wikipedia page all the graphs and tables are in nanometers except that one. I don't know where Munro got his fire spectrum; it seems very idealized. Googling for for 'infrared spectrum of a wood fire' gives a lot of spectra, none as simple as his. Wikipedia has this. Even accounting for the fact that the spectrum is flipped in direction compared to Munro's, its not a good match, but the big spike is probably CO2. Flumble wrote: At first I thought it was the heart-warmth. BUt I thought it was the whole of the E-M spectrum, with a spike in the TV transmission band. Location: impaled on Beck's boney hips. Ugh I hate those new bright blue-white christmas lights. I really like the slightly yellow ones much better. Zohar wrote: Down with the hipster binary! It's a SPECTRUM! I've created an image of the fire & tree as it might look, but I can't post images on here. Links to Dropbox get flagged as spam. Anyone help? mpatricke wrote: BUt I thought it was the whole of the E-M spectrum, with a spike in the TV transmission band. Hahah, they'd better not be watching one of those loathed christmas films. cryptoengineer wrote: I don't know where Munro got his fire spectrum; it seems very idealized. Googling for for 'infrared spectrum of a wood fire' gives a lot of spectra, none as simple as his. Wikipedia has this. Even accounting for the fact that the spectrum is flipped in direction compared to Munro's, its not a good match, but the big spike is probably CO2. I was wondering about this too, and some googling revealed that the spike must be 4.3 µm from CO2. But then the blackbody spectrum can't be right. The intensity keeps increasing well beyond the CO2 spike, which according to the graph above, suggests a flame temperature of less than 200°C. Too low to burn normal wood. Yeah, I just realized it's not just the flame but the whole fireplace, the majority of which must be cool enough to increase the lower IR intensity. Randall was probably right after all. orbik wrote: I was wondering about this too, and some googling revealed that the spike must be 4.3 µm from CO2. Or maybe the fire's behind a glass door panel, and the spike is a transmission line of the glass. <-- I completely made that up. The spike is due to a molpy going up in a puff of smoke. If we're looking at the whole fireplace, CO2 makes sense. There is a lot of hot C02 gas in there to make the spectral lines and I have built CO2 detectors that work by detecting absorption in the infrared, so there is definitely a band in there somewhere. Can you do the Fire? oops. It has been done. If you estimate the wavelength scale based on the colors (can't seem to attach my version sorry) it looks like the spectrum is linear in wavelength or pretty close. The peak is at maybe 900nm +/- 100nm. Which means not CO2. It might be water vapour, there's an overtone band at about 950nm. I'm surprised that it would be an emission (positive) peak instead of absorption though. Argh. A thought just occured to me. This strip could have been cleverly titled Spectra of Christmas Present. flukiluke wrote: Living in the Southern Hemisphere, it took a little while to get the idea of 'fire' for the big spectrum. The idea of fireplace at Christmas just doesn't 'click' to me. My brother-in-law's family in South America sent a video of their Christmas once. The most memorable scene was people in shorts and tanktops watching fireworks at night. I guess one could call the fireworks "Christmas Lights". I'm not going to lie, my instant thought was they were listening to the radio, but then I always do rush to a conclusion before then looking closely.